….on the counter top, in the drawers, in the cabinets, then the floor. After you have been brewing for many years you figure you have made every mistake know to brewers. Then one day you make a mistake you have never seen before. Brewed 12 gallons of Tripel and split the volume into two glass carboys as usual. One week later moved the carboy to pull the blow off tube. I use Brew Hauler's on all my carboys - absolutely love this gadget. Noticed a small amount of liquid under the carboy. Figured I must of spilled some beer from the blow off. Week later moving the carboy again and notice again a small amount of liquid. Figure I will transfer the beer to another carboy to be safe. Rigged everything up for the transfer and ready to go. Now I transfer every liquid under 4-5 psi CO2 pressure. Normally good technique, this time it was a bad mistake. Slightly opened the CO2 valve and immediately blew the bottom off the carboy. Six gallons of beer immediately poured over the counter top, into the drawers, into the cabinets. Spent the entire afternoon cleaning up the mess. 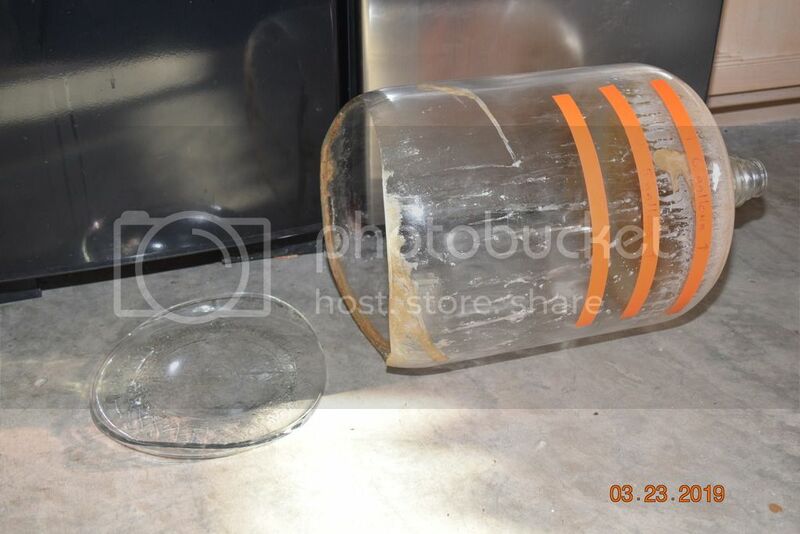 I have used these glass carboys for many, many years. My brewhouse has a concrete floor. Now I have never slammed the carboys down hard on the floor. The Brew Haulers really help control the descent. However, they do tap the floor lightly. I surmise this constant tapping over the years cause micro-fractures in the glass. Not big enough to see when they are being cleaned. Apparently enough wear through the years and they eventually fail. I am need of help with Bru'N Water V5.5 issue with 25% phosphoric acid. I have already emailed Martin last year about this problem. He has assured me V5.5 is the most accurate version to date. Ran hand calculations for years prior to Bru'N Water's appearance. I have run this brewing scenario multiple times with the same result. The water data is identical in both versions. The grain bill is identical in both version, Pils 25 pounds. The second very odd occurrence is I re-downloaded V4.2 & V5.5 to retest this problem. Have always used 2.8ml of 25% phosphoric acid per gallon of sparge water. Now both calculations give 4.55ml of phosphoric acid per gallon. Tried that and I get sparge water in the pH 3.2 range. If any keen eye can spot a mistake I have made I will owe you a beer. Ingredients / suggestions for food (beer) safe wetting agent? My water is very hard. It leaves larger water drops especially on glass, and mineral spots unless wiped off immediately. I was thinking of adding some kind of food safe wetting agent. Would especially like to add a wetting agent to my sanitizers so they drop clean out of glass vessels, rather than beading up. Couple years back I bought two large stainless steel welded "hop spiders" in 300 and 400 mesh. These are absolutely the best in the kettle, 300 mesh for pellet hops and 400 mesh for whole hops. Multiple pellet hop additions during the boil by just pitching the hops into the hop spider. Whole hop stands in the 400 mesh at the end of the boil. Mine are very well used over the years. That said they have been a challenge to keep clean. The 300 mesh (larger screen) cleans up well with hot PBW or oxyclean / TSP and lots of elbow grease. Not so the 400 mesh. The 400 mesh inside and out come clean. But in between where you cannot reach has become encrusted with crud. So much crud it has become no longer useable. I have been working on trying to clean the hop spider the past year. I soaked it in hot PBW. I soaked it in hot oxyclean / TSP. I painted it with CLR. I soaked it in muriatic acid. I soaked it in Acid#5. I gave up and was ready to order a new 400 mesh hop spider as I felt this one was at its end of life. Then I was out power washing the pond and I thought, what the heck, power wash the hop spider. If it breaks, I was going to buy a new one anyway. It is unreal how well that worked to clean the stainless steel mesh. Both these hop spiders are spotlessly clean. Did not break the welds. Put new life into both these hop spiders. I have use this Milwaukee MW102 pH meter for the last three or more years. I immerse the pH probe and temp probe into the solution, wait for the hour-glass symbol to stop blinking, take the pH reading. I have noticed if I leave the probe in the solution, the reading will drift upward in all solutions I test. The electrode probe was change out early this year. Meter is calibrated before every brew session. Is first reading correct, or is last reading correct? Equipment and Software / Any US source for peracetic acid? Has anyone found a US source for small quantities of peracetic acid, about one liter size or so? It is available to commercial breweries in 4.5 gallon size ($$). I have found it in several non US homebrew shops easily. Just got done rereading Martin Brungard's "Ca & Mg in Brewing Water" article in the new Zymurgy. Correct me if I am wrong in my interpretation of the article. Calcium levels of 40-50ppm is optimal for enzymatic conversion in the mash. Magnesium is of minimal importance in the mash. Malted barley generally contains enough calcium for the mash. Calcium is of minimal importance for yeast growth. Magnesium levels of about 42.5ppm is optimal for yeast growth. Maintaining a Mg:Ca ratio of > 1.8 improves yeast growth and fermentation. My brewing water has Ca 42ppm and Mg 18ppm. So there is really no need to add additional Ca as I have been doing in the form of CaCl2. I can in Mason jars starter wort, these starters would benefit from Mg additions up to about 40ppm. My Mg:Ca ratio is 1:2.3 so that is spot on for fermentation. Should my take home message be no additions of Ca to the mash, but add Mg to my canned starters? I would try this but would appreciate confirmation before the attempt. Thanks Martin for Brun Water, use it all the time! Yeast and Fermentation / In search of fresh Wyeast - are there really any dealers? I am so tired of going to my local homebrew shop and finding the yeast I want, only to discover its been sitting in the refrigerator for three months plus. So I then order online from the big mail order retailers, only to find it is two months plus since the production date. I feel cheated buying yeast at $7 / pack when its viability is 50% or less. When making big beers that means using multiple packs and multi-step propagation. Then there is the yeast vitality issue when its been poorly handled, (got too warm sitting in a box somewhere). Surely there must be some retailer out there that will sell me fresh yeast packs made last week. I remember when the Chi Company use to sell Wyeast shipped directly from the factory. Would love to find that kind of deal again. Yeast and Fermentation / anyone know where yeastcalc.com disappeared to? I have been using this great yeast calculator located at yeastcalc.com for the past couple years. Went there today and it is gone! This was the best yeast calculator I ever found, easy multistep volume additions for making really big starters. I feel lost without it. Anyone know where it has gone to? Just got done reading the Brewers Publication "Water" hoping to enlighten me on this question. Couldn't extract the answer. Mash salts I well understand. Calcium 50 - 100ppm, perhaps 85ppm is best target for most my beers using my hard water pH 7.8. Acidify the sparge to <5.8. Any benefit to adding sparge salts or kettle salts? Perhaps only if you use RO water or have really soft water? I have the impression, in my beers, either sparge salts or kettle salts just make the beer taste minerally. Don't think it adds any flavor benefit to my hard water. So mash salts only for the hard water brewer? RO / soft water then add kettle salts? Is this the conventional wisdom to date? All Grain Brewing / anyone add zinc sulfate / zinc chloride to wort? Just read the latest BYO issue and Chris White has an article entitled "Brewer's Yeast & Brett Fermentation Flavors". Great article and a good issue. Quoting from the article: "Many breweries make it a practice of adding food grade zinc sulfate, zinc chloride, or Servomyces (dead yeast loaded with zinc) to their wort at knock out in order to prevent acetaldehyde off-flavors." I have tried Servomyces ($$) before to improve fermentation and wasn't impressed it made much of a difference to my beers. Production breweries are trying to get these beers to tap quickly, so makes sense in that scenario rather than leaving the beer of the yeast cake to clean up acetaldehyde. Little zinc is suppose to be good for general yeast health. Trying to figure if this addition benefits homebrewers in any way. Been using this Blickmann Therminator for a couple years now. I run 5 gallons of PBW at 140+ degrees then 5 gallons rinse water via pump to clean, then back flush till clear. I thought all this time I was giving this plate chiller a really good cleaning out. Finished brewing last week and cleaned the plate chiller as usual. Unplugged the unit and set it in the sink to drain. Everyday this week I have run the back flush hose and I am getting quite a bit of grain bits/whole cone hop debris. I think I must have never, really cleaned this chiller out completely! Anyone got a great, sure fire, total clean method for plate chillers like mine that must be encrusted with barnacles of brew kettle debris? Just finished brewing today and have an interesting observation to share/discuss. Brewed an Imperial Stout OG 1.094. I use an in-line oxygen system into a 7.5 gallon glass carboy with a Hach luminescent dissolved oxygen meter in the carboy. Wort is at 65 degrees. I use the standard 1ppm/degree Plato oxygen per the "Handbook of Brewing", Priest and Stewart. I have been running this identical oxygen set up for about 2 years now. I run the wort into the carboy and adjusted the oxygen flow to hit my desired number, then immediately pull the Hach LDO out of the carboy. Today for the first time I decided to leave the LDO in the carboy and take a few readings over the next couple hours. Initial reading upon filling the carboy 20+ppm O2. Did not pitch the yeast. Over the next hour the oxygen saturation is down to 5.2! No yeast, carboy sitting at 65 degrees in the refrigerator. I was blown away how quickly the oxygen came out of solution. Pitched the yeast and thirty minutes later oxygen saturation of zero! Appears to me that my in line oxygen set up is near worthless as most all the oxygen came quickly out of solution in the carboy. I always thought an in line oxygen system was the most efficient method. I now suspect any other delivery system would suffer this same problem. Perhaps a better way is to rack to the carboy and run a very slow, continuous oxygen flow via airstone into the carboy for the first 24 hours? The numbers I find quoted are 25% - 35% calcium carry over from mash tun to kettle. I have assumed the spread may perhaps be related to some brewers using calcium additions to sparge water -> maybe. I have also seen quoted that probrewers like to use 2/3 calcium in the mash and 1/3 calcium in the kettle. How much all this is true I don't know but these numers seem to come up most frequently in my research. So I have been shooting for 100ppm calcium using both calcium chloride and calcium sulfate at various ratios depending if it's a malt forward beer or a hop forward beer. That means my kettle carry over is down to 25 - 35 ppm calcium. Seems to me I would top off my kettle with 65 - 75ppm calcium to hit the 100 ppm mark. That's a 57:43 ratio vs recommended 67:33 ratio - but close enough I believe. I am finally going to make a Deus clone using Drew Beechums / Maltose Falcons recipe and directions. The Deus spice recommendations are lavender, cinnamon, allspice and ginger in the bottling sugar solution. However, he makes no quantity suggestions for each of these spices. Anyone done this recipe and have suggestions on the amount of each spice to use?